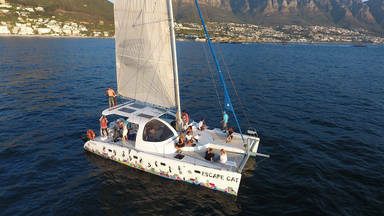 High speed jet boat trips, sailing, whale watching and more in Cape Town, Cape Town Central. 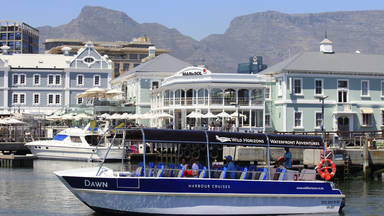 Waterfront Adventures offers spectacular sightseeing boat trips from the iconic V&A Waterfront. With incredible views of Cape Town’s renowned coastline and Table Mountain, you can expect perfect views from all angles, whale watching opportunities and sunset cruises with Waterfront Adventures’ tours. Waterfront Adventures boasts over 10 adventure options, ranging from jet boat cruises to boat trip packages with helicopter flights or bus tours, so there’s something for every taste. These guided trips offer a fun and exciting look at the city, making them perfect for tourists, families and groups. Always a great way to show off the city to friends from abroad!... - Mark Jardine. Book things to do at Wild Horizons Waterfront Adventures. Find the best things to do at Wild Horizons Waterfront Adventures. What people say about Wild Horizons Waterfront Adventures. Always a great way to show off the city to friends from abroad! For the most part, we enjoyed the sunset cruise. The captain(?) was a bit reckless in his attempt to give his passengers a thrill by raising the sails. It appeared that he did not anticipate that the wind would pick up like it did, causing the boat to heel more than he thought it would and we began to take on water over the gunnels. Once the sails were lowered, and we reached calmer waters, the ride was lovely. The sunset was spectacular! It was easy to book online. The cruise was great, it was the first time for my 8 year old daughter and she had a blast. It was cancelled on the morning we were due to go out. I was sent an email, but was flying to SA at the time, so when I landed I glanced at the email and saw in bold and big font 'confirmation' so I headed down with 5 friends for 6pm. On arrival, I was told to look again at the email where I saw, in tiny font, half way down the page, a brief line that it had been cancelled. I don't see how on earth i was supposed to see that. Bad communication. We were very disappointed.